This is the oldest continuously operating synagogue in the Western hemisphere, dedicated in 1732 and home today to a dynamic congregation. 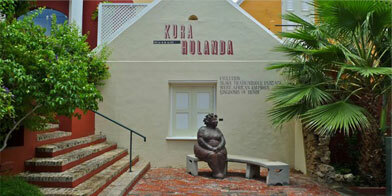 Both the synagogue and the museum are one of the Curacao’s major tourism attractions. The Museum has many priceless artifacts from throughout the congregation’s history, including Torah scrolls, Hanukkah lamps and replicas of 17th century gravestones. 2:30 pm. – 4:45 pm. This small museum, owned and operated by the Central Bank of the Netherlands Antilles, displays a unique collection of rare coins, as well as semi-precious and precious gems. 1:00 pm. – 4:30 pm. This museum is located in Punda’s oldest standing building, an elegantly restored wood and stone structure that was originally built in 1693. 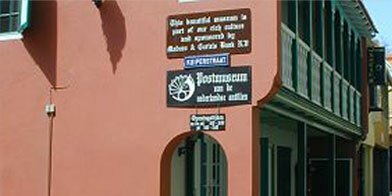 It houses permanent exhibits of stamps and related artifacts from the Netherlands Antilles, such as old boxes and scales. This small museum is located in the back of the historic Fort Church in downtown; home to the island’s first Dutch Protestant congregation (which is still active). The church itself is the inner courtyard of Fort Amsterdam, seat of government of the Netherlands Antilles. Among the museum’s treasures are centuries-old congregational relics and some of the oldest maps of the island. This museum is located in a mansion built in 1729 and is completely decorated in a maritime style with a gangplank, portholes and ship railings, all in brass. 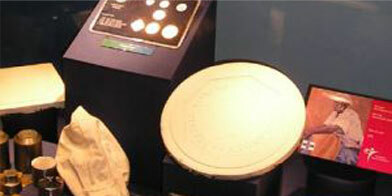 Video presentations and multimedia displays are used throughout the museum to bring Curaçao’s maritime history to life. Exhibits include antiques miniatures, sunken treasures, ships artifacts, maps and 17th Century ship models. The museum has its own ferry for tours of the harbor. Owned and operated by the national telecommunications company, this museum traces the history of telecommunications on Curaçao, from the arrival of the first telephone in the 1880s to fiber optic cables and computerized teleconferencing just a hundred years later. Venezuelan merchants bring fresh vegetables and fruits over on small fishing boats to sell to Curaçaoan homemakers; double as living quarters for the weeks they are away from home. Certainly, one of the most famous islands picturesque sight. Opening hours: Mon-Fri: 9:30 am – 6:00 pm; Sunday till 2:00 p.m. If sampling authentic local food in noisy surroundings is your idea of a vacation must do, then don’t miss lunch at Curacao’s famous old market. Hygiene and food quality are excellent, portions are generous and prices be beat. Seating is strictly first come, first served, at a few small tables or long counters. Located on the western side of Otrobanda, this 19th century building is the largest museum on the island. Its permanent exhibits include an extensive collection of antique furniture, art, artifacts of historical significance and paintings by some of the island’s most well known artists. The museum also organizes special exhibits by local artists and the pleasantly shaded grounds are sometimes the venue for concerts and cultural presentations. In a captivating way, this museum impressively exhibits the Trans-Atlantic Slavery in its totality, from slave capture in Africa through the Middle Passage and relocation to the New World. The impressive African collection pieces bring the African past nearer to us. This is one of Curaçao’s most popular attractions on the island that offers a total package: Entertainment, education, adventure and relaxation. Dozens of large aquaria showcase hundreds of species of fish and other sea creatures drawn directly from Curacao’s waters. There is a touch tank, a shark pond and a sea lion channel, plus an underwater observatory where you can watch shark and fish feedings. At Animal Encounters, visitors can snorkel or dive in a natural seawater pond filled with fish and eagle rays. You will also find an air- conditioned mini theater with 3-dimensional slide shows and video presentations, a Marine Awareness Center with educational snorkel programs for children, a museum with fascinating exhibits, including sharks’ jaws and extensive shell collection, a photo shop, a souvenir shop, a snack bar and restaurants. 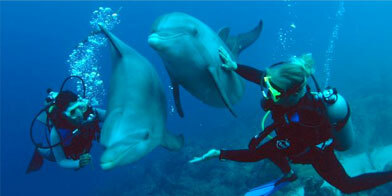 Don’t miss the newest attraction “the Dolphins” and all their history, legend and myths. Dolphin academy gives you the opportunity to get closer to these magnificent animals through their different informative programs: dolphin dive, dolphin encounter, dolphin snorkel or by simply enjoying their dolphin show. Is one of the biggest breeding farms outside Africa and unique to the Caribbean. The farm offers you guided tours every whole hour, to show you the complete development of these fascinating birds from egg to mature bird. Here you will also find a typical restaurant, where you can dine in real African style and an art and souvenirs shop, where you can buy all kinds of sculptures, wooden-carvings and exotic leather products. Just outside the heart of the bustling Salinja Shopping District, you will find the former plantation house “Chobolobo”. This picturesque historic mansion houses the Senior & Co. distillery, which has been producing the authentic Curaçao Liqueur for over a century. A visit to the island is incomplete if you haven’t stopped by to savor the internationally renewed beverage and its fascinating history. Discover the secret of Curaçao’s Golden Oranges! At the Sea Aquarium Beach you will discover a beautiful stretch of soft, white sad shaded by dozens of coconut and date palms. All you could ever want in a sun-and-turf leisure spot: restaurants, bars, shops, shade, showers, lockers, water sports, snorkeling, kid-friendly surf, and a party-hearty crowd. Sunday, starting at Happy Hour, it’s a people magnet. Choose from three outdoors clubs: Wet and Wild, Mambo Beach and Bananas and dance the island’s best bands on Sunday nights. Opening hours: Mon-Sun: 8:30 am – 6:00 pm; Sunday till 2:00 p.m.
Curacao’s small zoo has a modest selection of primates, mammals and reptiles in traditional cages, as well as a water bird pond, a birdhouse, free roaming peacocks and even a camel. There are two playgrounds, for younger and older children, and plenty of room to run in the shade. This charming rustic garden is a lovingly assembled collection of dozens of herbs and other plants, which have a traditional place in local culture. Many are time-tested remedies for a variety of ailments, from digestive ills to heart trouble to diabetes, dating from the time when slaves had no access to doctors. There are also more different types of basil than you could imagine, each with its own characteristic fragrance. With tour guide (min. 8 persons) USD> 6.00 per person.